The Monday of Memorial Day weekend, Wendy and I took the girls out for the day. 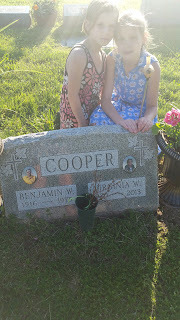 We thought we’d give them a chance to visit with their great-grandparents, and take some time out of our busy lives to visit the cemeteries where various family members are buried. It just seemed like the right thing to do at the right time. Wendy’s grandparents have a great garden out at their house. Well into their eighties, they still keep up a garden and a pretty big yard. Wendy’s grandfather had a couple of strokes a few years ago. He’s been having a difficult time getting around since then. He’s a fiercely independent man. No one is going to tell him what he can or cannot do. (Well, he has been convinced that he cannot drive his car anymore.) Amazingly, when we pulled into their driveway, there was Grandpa mowing the yard on the rider. He does more in his eighties and post stroke than most people in their twenties and thirties. Meanwhile, Grandma is bent over in the garden pulling grass and weeds from around the strawberry plants. Wendy and I volunteered the kids, and together we got most of it all done in about an hour. Then we spent some time just visiting with them without a mower or a hoe in our hands. The girls played dodgeball on either side of the clothesline, just whipping an inflated ball at each other’s heads. The plan after leaving Wendy’s grandparents’ house was to go to Lyndonville to stop in at the Hojack Ice Cream Shack for a treat. There was actually a reason to stop there besides the ice cream. JoJo needed to get a menu from a restaurant for a writing project at school. It gave us a pretty good excuse to go get some ice cream. Not that we needed an excuse, though. On the way, I made an executive decision that we would make a couple of stops on the way. By executive decision, I mean that I was driving and they had to sit through my detours. When we got to Medina, I turned into Boxwood Cemetery, where my great-great grandparents are buried. I explained to the girls why were at this burial ground and who the people were. I tried to explain how they were related. Then we went out to Bates Road Cemetery, just off Route 104 in Ridgeway. My great-grandparents are buried there. I hadn’t been there in awhile, but I knew the general location of the stone. 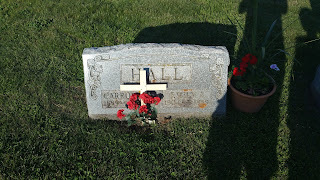 As we walked around looking for the stone, I found the markers of other family members. Each time I came across one, I explained how we were related. I’m sure they don’t quite grasp the concept yet, but I’m hoping that seed is planted for later. We finally made it to the Hojack Shack for the promised ice cream. It’s a busy place, but the girls enjoyed playing on the playground while we waited for our food and treats. After all that, we went over to the cemetery in Lyndonville. 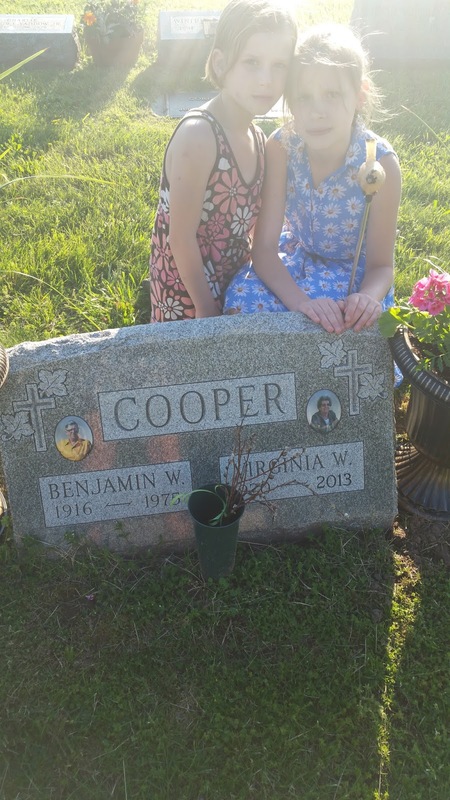 The girls wanted to visit Old Grannie’s grave. At the same time, I once again walked the cemetery pointing out various relatives. My MeMe and PaPa are also buried there, so we walked down to the opposite end of the cemetery to pay our respects. Earlier in the week, my Dad had asked me if I knew where in Lynhaven that his Lacey grandparents were buried. I knew the approximate location, and told him. So, when I got to the cemetery, I went looking for their graves. It took awhile, but I found their graves almost exactly where I thought they were. Unfortunately, they do not have a headstone, but they are buried between two marked family member graves. As we meandered through Lynhaven, I tried to instill a sense of history with my children. In the oldest section of the cemetery, family names were plentiful. One of the kids asked why. Our family, especially the Barry family, were among the first people to settle in the area. All their children, grandchildren, and so on, are buried in the pioneer section of the burial ground. That old section is a veritable who’s who of the men, women and children who carved out a life in the wild frontier of Orleans County and made Lyndonville a home. Initially, we wanted to drive along the lake on the way home, but it was starting to get quite late. Instead, I drove them to the Baptist Church in Yates Center that was founded by my 5x-great grandfather. (His son-in-law, my 4x, great grandfather helped to organize the Methodist Church in which Wendy and I got married.) Behind the church was a vacant piece of land where my grandmother grew up. I explained all that to the girls. Maybe some of it sunk in. Even though it was getting late, I felt we needed to stop by Mountain Ridge Cemetery on the way home. Wendy’s father and her mother’s parents are buried there. It seemed only right that we paid them a visit, too. It must be hard for Wendy. I haven’t lost a parent, so I don’t know what she feels about visiting her dad’s grave. I feel it’s something that our daughters need to do, though. Family is important. We spent our entire day together as a family and remembered those family members who have passed. I tried to instill a sense of history with the girls so they understood the importance of all these people who we only know by the shapes of their headstones. They helped to make us what we are today. We can never forget that. Craig Bacon spends a lot of time investigating family history. It is a passion nurtured by his grandmother, long ago, when he was the same age as his oldest children.